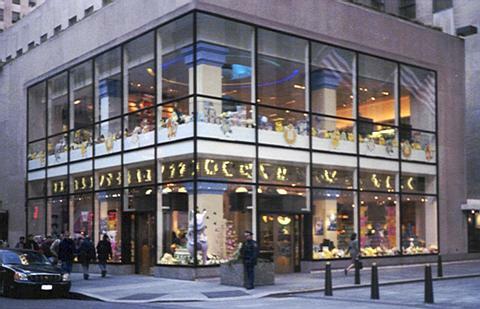 Nintendo of America opened the New York branch of the Pokemon Center rather quietly on November 16th, 2001. The few people who knew what a "Pokemon Center" was were happy--a whole store with nothing but Pokemon merchandise! There are only two other stores like it in the world--the Pokemon Center in Tokyo, Japan and the one in Osaka, Japan, so getting one in the United States really is a special event. The store wasn't hyped much probably due to a combination of the franchise's dropping popularity and the fact that the city was still mourning the tragedy that had occurred two months before. Well, everyone may not be able to visit the center, so this feature is to guide you through the store located in the Rockefeller Center. A really big super-thanks goes out to Raichu 526, who did the write-up and provided all the pictures you'll see. Enjoy! By the way, the Pokemon Center New York website can be found here, while the one for Osaka and Tokyo can be found here. Rockefeller Center, New York. Home to the GE Building, Radio City Music Hall, and the world’s most telegenic skating rink. It is also now home to the Pokémon Center, the first of its kind in the United States and only the third in the world. Two floors of Pokémon, Pokémon, and more Pokémon. Let’s take a look around, shall we?